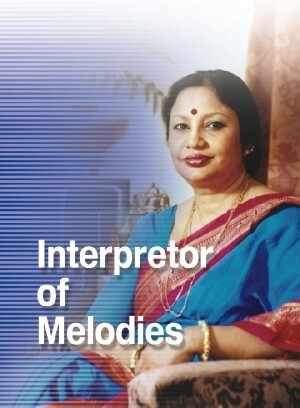 “My mother used to say I started to hum much before I started to talk,” Ferdausi Rahman, one of the finest artistes of Bangla music, speaks of her initiation into music. Being the only daughter of legendary Abbasuddin Ahmed, the king of Bangla folk songs, music was very much in her blood. Her first lessons in music began under the tutelage of her father. “My father would take not only me, but all three of us (Ferdausi and her two elder brothers, Mostafa Kamal Abbasi and Mostafa Zaman Abbasi) together and make us sing with him. Sometimes I used to accompany my father to different places to sing with him. Sometimes, however, he would leave me alone on the stage and make me sing,” she remembers. Ferdausi took lessons in classical music from several renowned Ustads like Muhammad Hussain Khosru, Yusuf Khan Uuraishi, Qader Zamiri, Nazakat Ali Khan and Salamat Ali Khan.